Cheesy, creamy and comforting with a hint of sage. 2. Fill a large saucepan with water. 3. Add the potatoes and 1 teaspoon of salt and bring to a boil. 4. Boil the potatoes until they are very soft. 5. Drain and set run through a food mill, or ricer for nice smooth potato. 6. Put the potatoes in the fridge until they are cool, this will help keep them fluffy. 7. Prepare 2 sheet pans by dusting them with flour, set aside. 8. On a clean work surface mix together the potato and the flour and knead for about 4-5 minutes until the dough is soft and smooth. Only add enough flour so the dough comes together and is not tacky. 9. Cut the dough into 4 equal parts. Roll one 1 quarter of the dough into a 3/4 inch log. 10. Cut the log into 3/4 inch pieces. 11. Roll the pieces over a gnocchi board or the back of a fork to create ridges onto the floured sheet pan in a single layer. 12. Repeat with the rest of the dough. 13. Let the rolled gnocchi dry out for about 1 hour before cooking. 14. Bring a large saucepan of water to a boil. 15. Once the water is boiling, turn the heat to a gently boil, so you don't break up the gnocchi. 16. Add the gnocchi and boil for about 3 minutes, or until they rise to the top. 17. For the cheese sauce (while the gnocchi is cooking): In a medium saucepan over medium heat, melt butter. 18. Whisk in the flour and whisk until flour turns golden brown, about 3 minutes. 19. Add the warm stock and continue to whisk until it thickens, about 3 minutes. 20. Add the fontina and parmesan cheese and stir with a spoon until melted. 21. Stir in the chopped sage. 22. 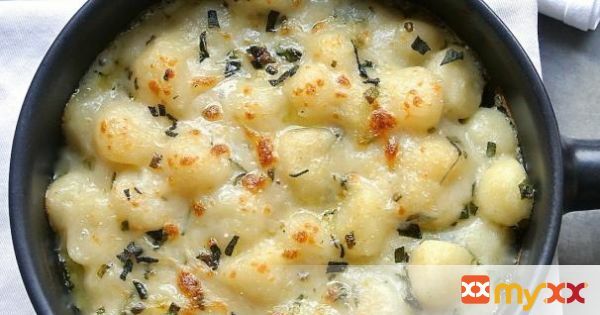 Stir in the cooked gnocchi and transfer to a casserole or baking dish. 23. Bake for 15-20 minutes or until the top is golden brown and bubbly.